to create a project of my choice! Roll to apply and then swipe the tip to the side for a clean break. I purchased this set of pre-cut wooden letters at Michael's for my daughter's room. I chose three different patterns of black & white patterned papers by Doodlebug Design. I applied the Xtreme Permanent Adhesive around the edge of each wood piece. to use an adhesive that I knew wouldn't give-way after a month or two! around the edge of the letters; this helps to give a clean, finished look! writing pen and draw a line of glue around the edge of the letter. Press the baker's twine into the glue and hold for a few seconds to secure in place. I attached a length of ribbon tot he back of each letter for hanging. 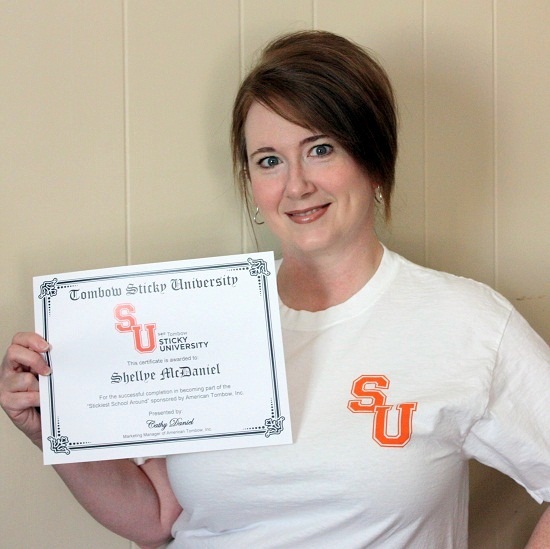 Lastly, let me share a photo of me in my SU t-shirt and holding my diploma! 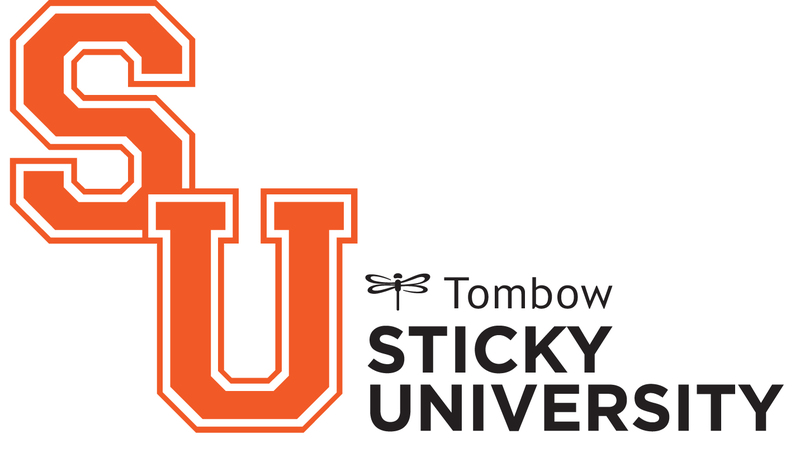 Visit the Tombow Blog to see more great stuff from the Sticky U Alum! Wow, aren't you just the cutest alum I have ever seen!! I think you are so darling! And as far as being in the Sticky University - you, my dear friend, are a shoe-in!! You are one person who never seems to have an messiness with adhesives on your projects - you never get Sticky!!!! Maybe you do, but I never can find any fault with a project of yours!! These letters for your daughters room are gorgeous - love the black and white with the subtle touches of color on them!! She will treasure these and they look amazing!! Have a great Sunday!!! Nice job Shelly -Love the words Looks like it will stay stuck!! !I'm your newest follower and Alum together I hope you willl come follow me.